The idea behind this is to create a CD based on the music of the C64 with exactly that genre in mind. Most C64 Sids were created in the 80's many lend themselves to the sounds of 80's electro. We thought the commercial sounds of the 80's could be made into the remixes of the sids themselves. So Remix64 CD was born. To be published under www.c64audio.com in time for a Chritmas 2002 release (erm.. hopefully). We have scoured the internet for potental musicians and feel we have recruited the best people for the 80's electro style. People such as Marcel Donne, Chris Abbott, Boz, Glyn R. Brown, Fabian del Priore, N-joy and DHS of the soundwavers, and many more... We have even Recruited ex c64 composer Thomas Detert. So what's gonna appear on the CD? plus many more to be confirmed. Today we received a beta version of Ocean Loader 4 from Marcel Donne. I was very surprised to get one at this stage of development. Even more surprised to find that the beta was already sounding exceptional. Without giving too much away it's a cross between Kraftwork and Moroder. The name of the CD was something of a challenge. After coming up with several ideas we decided to call it simply.... Remix 64 . Probably we'll add a sub-title to go with it. Lman's alpha of Parallax sub tune 4 arrived today. It's showing good signs with special attention on the nice analogue feeling baseline. Thomas Detert has decided not to go ahead with Quadrant. He feels that it doesn't fit the style. He instead may go with HYPER AGGRESSIVE Title Theme in an ART OF NOISE Style. Though this is not yet fully decided. We'll be needing an artist to help design the booklet for the CD. If you think you maybe able to help out contact us. Confirmation today that Thomas Detert will be doing Hyper Aggressive Title Theme in the sytle of Art Of Noise. Plenty of initial interest by Artists for the CD artwork, but no real comitment as yet. Still i'm pleased by the response and hope to sort this out very soon. I'm getting plenty of requests from musicians to participate in the CD. Though most of the positions are now filled. I'm always on the lookout for something a bit special. If you think you can deliver something of outstanding quality (WITHOUT SID) then feel free to contact me. We have our artist and a very good one at that. I've seen some sketches of the cover and i'm mighty pleased how they are looking. Last night Marcel Donne sent me his final version of Ocean Loader 4. Talk about impressive stuff. I've been listening to it over and over again in an attempt to hear if there can be any possible improvements, but Marcel has done such a tremendous job i can't even think of one slight modification. Ocean Loader 4 has never sounded so good. After realising that there was a need for a CD quality remix of Ocean Loader v1, Marcel Donne is providing the remix for this track. Marcel will now be providing 3 tracks towards the CD. This is more than any other arranger. Hyper Aggressive Composed by Thomas Detert and remixed by Thomas himself final version arrived today. The Art of noise styled remix has stunned remix64 and our publishers alike. We were that pleased with Hyper Aggressive that when Thomas mentioned he'd like to Remix Green Beret Title music in the style of Vangelis, we gratefully accepted is offer. Funny how this is turning out. We originally started off with no Galway at all. Now we will have Parallax,Ocean Loader V1 (Fast Version), and Green Beret. Due to reasons beyond our control, the r64 website hasn't been updated as much as i would have liked.. Two main reasons for this is a massive Hard Drive Crash on my cpu. Also there's been difficulty keeping the website on-line.. This is not our fault but that of the provider. Hopefully all should be well now. Well we now have our front cover which we will be desplaying shortly and the back cover is coming on nicely too... Though i doubt we will be desplaying that in the near future. Fabian's remix of Hollywood poker is coming on... It's currently in the process of quality control checks. Another remix has almost been finished by Thomas Detert... Green Beret title tune in the style of Vangelis. We are currently making a few minor adjustments to this arrangement which if i do say so myself... Stunning. Thomas has informed me that this is a once in a life time remix as he won't ever be remixing another persons work again. So if you are a Thomas Detert fan and you want to hear remixes of his own work and that of Martin Galway then you are gonna be in for a rare treat. Today i heard what could be called an alpha version of Ocean Loader (FAST VERSION) which will be appearing on the CD. Marcel's Vangelis/bladerunner styled remix is extremely inventive. Two guys are working on the remix of Ark Pandora. Mike and a different Marcel. (Thanks to Marcel Donne for arranging this). This remix will feature REAL guitar. Marcel Donne has heard a Beta version over the phone and said that we will in for a real treat. The Green Beret remix by Thomas Detert features REAL guitar in the background. Thomas hired a guitarist especially for this remix. DHS of The Soundwavers has started his remix of Panther. I heard a short pre-alpha today. At this stage it's too early to coment, but knowing what Dhs is capable of i'm expecting something rather good. It's staggering how enthusiastic the remixers have been. They have really knuckled down and got on with the job and have produced some fine work. It's not impossible that the Xmas 2002 release date could be brought forward. Steve Barratt, our artist has finished most of the artwork. He has designed a rather tasty Advert specially designed for the upcoming one-off issue of Zzap64!, which as far as i know will be lauched in Febuary 2002. Remix64 has sealed a verbal (contract pending) sponsorship deal with Thomas Boecker (The Merregnon Development Team.) He has agreed to sponsor both remixes of Hollywood Poker and Red Max from Fabian Del Priore. He's also taken over as producer for both these two tracks. Those who have heard his work with Merregnon will agree it's a good deal for remix64 and Merregnon alike. Musicwise Trace sent us a beta of Platoon which he is working on which will feature on the CD. Originally this wasn't part of our plans, but trace so far as done a wonderful job, that we grabbed the opportunity with both hands. Glyn R. Brown has been steadily working on Deliverence by Matt Gray. Havn't managed to hear anything from this as yet, but the work-rate he has put in getting it to sound perfect has been tremendous, hopefully the results will show. Lman has been working too on Defender Of The Crown (Love theme) and Nemesis the warlock both are in the early days but what i have heard so far is impressive. As you can see the track list is constantly changing and i expect it will be very different to what was originally planned. The main disapointment so far is that we had planned for some remixes from Jeroen Tel's SIDS. But due to the complex and uncooperative manor of several key players in the music industry including EMI, it's looking very much bleak on this front. So bleak infact that we are now working on the presumption that no Tel will feature on the CD. Lmans Defender Of The Crown's love theme is now in the final beta stages. We are currently trying to enhance the mix further before we can say we have the final product. So far though it has great promise. Glyn has been quietly working away, chopping and changing for a couple of months now with Deliverence. He sent me a small beta of which is already sounding awesome. This remix is set to send you back to the 80's club nights. Glyn has done an exceptional job so far in re-creating what i would say is as perfect to what he was aiming for. Can't wait to hear the full version. Ocean Loader 1 (Martin Galway) remixed by Marcel Donne is well on it's way now and is not far from being complete. The remix is of the Fast version and has more than a distinctive Jarre flavour. At the moment Marcel plans to add a vangelis bladerunner style intro to the remix. Marcel also coments that we should be expecting a beta of Ark Pandora anytime now. Green Beret has now been finished by Thomas Detert. With the modifications we suggested he's enhanced the remix even more than what i would have hoped. Thomas knows exactly what buttons to press when it comes to making qulity music, and he's created what i would say is one of the best remixes i have heard. It seems a pity really cos Thomas's contribution to the CD is now over. He's done his 2 tunes superbly well, and we at remix64 thank thomas for a sterling job well done. Good Work Thomas. Glyn R Brown's remix of Deliverence was sounding awesome. Was! - Well i say that because Glyn has found himself banging his head against the wall as his files have got corrupted. All seemed over for Deliverence, but after a bit of messing about he managed to open the file and save it again, though the samples are all over the place the structure has remained intact. Glyn now is painstakingly working away at bringing the tune back to life with a bit of luck, grit and determination we may well have this tune back in it's full glory (hopefully). He also sent me a short preview of Parallax Highscore which was already sounding like a great remix. Ark Pandora by Marcel and Mike features synth with a tasty miami style guitar. Though many adjustments are to be made to this tune it shows great promise. Ark Pandora has been scrapped in it's current form. We spoke at great lengths about this remix and it was thought that a different direction was needed. The tune may just have been too odd for many peoples tastes. So it has been decided that well go for a new direction for this remix. Jan Hammer style is now the plan. Fabians Redmax is coming on nicely now, we are adding bits here, removing bits there, chopping and changing and we are getting there. Styled in a Paul Hardcastle kind of way, the remix of David Whittakers tune is sounding superb. Again Ark Pandora was scrapped, as it still wasn't quite hitting what we was looking for. We've started again from scratch with this one. Still not 100% sure if well let you have the rejected remix for free as yet. Both Fabians remixes are finished i'm awaiting the remarks from Thomas Boecker his producer before we can say it's ready. Panther by DHS is coming on rather nicely and sounds so very 80's too. There could be singing on this remix if that is decided. I'm not 100% sure what the direction of this remix will take. I'm getting a little concerned about the release date.. things have slown down these last two months and we need all work completed by the 31st of march to be sure of the Bitlive 3 release date. I'm quite optermistic that the CD will be launched in time, but i'm just a tad worried about falling behind schedule. Deliverance came today, it certainly raised my eyebrows to what glyn has achieved and in Glyn's own way played down the piece. But i can say that i'm hooked on it. Over the moon with it infact. A few very minor touches need to be made to it, but it's just about finished. I spoke today in length to Thomas Boecker (Fabian Del Priore's producer)he's working with Fabian to improve both the tracks he's done. They are already damn good but me and Thomas will not settle untill everything is perfect. A few questions as to the quality of the artwork with the CD has been raised. We are now weighing up our options. Lman has made some changes to Defender Of The Crown (love theme) it's now sounding much more like what i expected to hear and i'm pleased with the progress of the remix. Lman states that he needs to make a few tweaks to the remix yet. Lman has also recruited Wobbler to work with him on Nemesis The Warlock. It's possible That a remix of Glider Rider may appear on the CD. Top musician Markus Holler will be sending us a 1 minuite remix of the sid for a taster and if we have the space we may well recruit him to complete the piece. Things are begining to hot up now as we are starting to hit schedule targets again. Things are beginning to look rosier as to hitting the release date, even though we need all remixes at remix64 by the 31st of march to be sure of the bitlive 3 release date we've made significant advancements of late. Finsihed now is Lmans Defender Of The Crown which in the original composers own words is Fantastic, Rebecca in new clothes . Jim Cuomo's help and input was undoubtably one of the reasons why this track has turned out so well. Ark Pandora is now sounding much more releasable with significant improvements in all areas. Glyn R Browns Storm is coming on nicely too. I heard an early beta and again Glyn is producing some excellent work. Actually talking of Glyn he's beginning to make noises across the scene with his music with many people recognising his ability as one of the best remixers on the scene, even though many have yet to hear his best work. Chris Abbott and Boz have just about finished Thrust. Chris and Boz have managed to recreate a very faithful sounding thrust yet keeping with the 80's feel. Some modifications are planned to this track, but it's certain to be yet another classic CD track from the team behind Back In Time and Karma64. Glider Rider has now been finished. Markus Holler has given the remix a total overhaul and produced one of those rare tunes that stick in your head and won't go away. Might make just one alteration to this, but nothing too drastic, cos it's fantastic the way it is. There are further plans for the remix than just our CD, but for the moment i can't go into too much detail. 3rd version of Ark Pandora came today, and while it improves everytime we still can't accept it for the CD as yet. The CD is turning out far better than i could have hoped for and with help from many people namely... Thomas Boecker (Merregnon Development Team) The CD has gone on leaps and bounds. Also special thanx to Jim Cuomo, Chris Abbott, Jan Zottman, Jan Lund Thomson for their valuable input and help. Nemesis The Warlock is now in beta stage. Wobbler and LMan are working together on this and are producing a promising piece of work. Though there needs to be many alterations the complex background gives the piece added meaning and power. Lman stated the cooperation between him and wobbler has proved to be a successful venture. The reworking of Redmax is turning out much better we are still working on the remix, mainly working on it's lastability of interest. The Paul Hardcastle approach has been further enhanced by an idea Chris Abbott came up with. For this idea we needed to employ makke for a bit of vocal talent, by all accounts it has really added some atmosphere to the track. Thanks Makke for your prompt help. Imagery for the front cover has changed with Lman now taking over the reigns as artist. The innitial beta imagery looks cool, we are now working on adding some extra elements to it. Well here we go... A lot of progress has been made since i last entered an entry to these pages. Lmans/Wobblers remix of Nemesis The Warlock has been finished and is sounding great. It took a while to get right but i think you'll be very impressed with this remix. We added a few vocals to this to help the 80's feeling and also to give it a more forbidding nature ofwhich was prominent in the original sid. The Fantastic Glider Rider which i thought was nicely finished has taken yet another step further after Chris Abbott provided some additional arranging bringing in a Guitar towards the end of the piece. It's just a matter of pasting it now to the remix. Panther has also been finished in a Kraftwerk style. The main feature of this is the unusual guitar sound which works wonders. Unfortunately The planned Human Race subtune 4 may have to be dropped. This is mainly cos we have too many tracks for the CD and personally i felt the track wasn't quite right in some areas. But untill the 31st who knows what can happen. It does have a fantastic 80's background which works exceptionally well. Ark Pandora has come on leaps and bounds thanx to Marcel Donne who has stepped in at the last minuite and brought a much warmer sound to the remix. Features real Guitar playing the main lead. Starball from N-joy arrived Yesterday and sounds classically Huelsbeck. Not only that but it reminds me exactly how Chris Huelsbeck himself would have dealt with it. Glyn R Brown's Storm has come on nicely too. It's going through further improvements, but is sounding typically Glyn and arranged very well indeed. This should be another great remix from Glyn. Fabians Hollywood Poker pro is currently going through re-arrangement and is beginning to show very much promise. The Artwork is coming out nicely and we are working like madmen to finish the booklet. Well talk about last minuite.. We got Glyn's finished remix of Storm yesterday at 10pm. But even more amazing we got the finished versions of Hollywood Poker pro and Redmax at 11:50pm. Anyway i'm pleased to say that All the remixes are now completed (pre-mastered) bang on schedule. 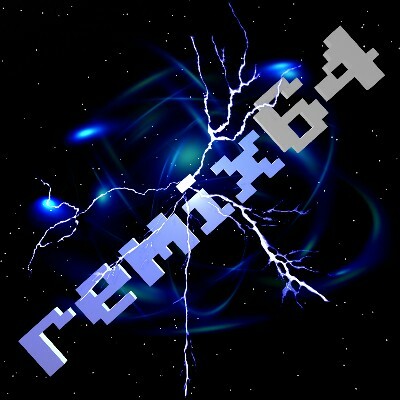 The release of Remix64 The CD is almost certain to be released at Bitlive V3. I said that Human Race 4 wasn't to be included on the CD, but hey i lied. Thanx to LMan who worked hard on the remix at the last minuite we have a quality track that will now appear on the CD. We've managed to get 17 tracks on the CD and i can tell you there isn't space for a particle of dust, it's that jam packed with music. The booklet will have an introduction from the producer, Screenshots, Arrangers coments, Producers Coments amongst other things packed into 8 or 12 pages. Also watch this space very soon as we'll be throwing in some goodies that never made the CD. There's gonna be Hollywood poker pro (FREE DOWNLOAD). Though we do have hollywood poker on the CD we have a free version to give away because we went for a completely new direction with better sounds and arrangement. The remix that will be on the CD is completely and i do mean completely different and much much better. Still the freebie isn't bad either. New artwork For the CD is now viewable. crikey things have really been busy lately. New artwork provided by Markus looks really damn good now, we've made the entire thing very 80's and looks the buisness now. A reversable front cover is now gonna be used. Markus front cover or Steve's Front cover? You choose, just flip the booklet over and make your decision which one you want to use.  Also the design for the tray card looks rather tasty too. Visitors to remix64 will undoubtable recognise the design style which markus has incorperated into the tray card with great effectiveness. The beta booklet has also been written and is going through one or two final ammendments which markus will incorperate into the design shortly. Post processing has now been finished and we are about to make some soundbytes for you to download. These will be online when we have finalised them. Yep, we are very much on track and it seems certain the we will reach the bitlive 2002 release date. well hectic period is coming to a close now. The booklet design i'm very pleased with. Markus has hand drawn images to go with the tunes info with coments from myself and the arrangers, and i tell ya what he's drawn them superbly... There's just no end to this guys talent. Ok final mastering has been completed now, i'm yet to hear the final master yet, but will do in the next couple of days, but from what i have heard from the clips i'm dead chuffed with. Taliking of clips. I have them now on my hard drive and we will be making three clips available for download every week, Starting this week. Well the music is ready, the booklet is just about ready. guess i'm now ready to sit back and relax a bit. HA HA! not on your nelly. Now i've to do a bit of that press relations stuff, and beleive me this isn't as easy as it sounds. Fortunately i've got a good bit of guidance from Chris Abbott here who's been mega in helping me deal with this kinda stuff. People have been asking me if there's gonna be a volume 2. Now this depends on several factors really. What i really want to concentrate on is our website and get that back upto speed. So that's my first task. Secondly will you guys like it!!! Volume 2 will only be made if this is a success. I'm not really bothered if we proft from this thing, but really i don't want to see anyone lose out financially either. If we don't at least break even then there will be no volume 2 for sure. If however it is a success then maybe, just maybe there could be a volume 2, but even then not without a good break inbetween. So far the website has delivered some of it's promises, but not all. We will make these promises a reality before anything else is even considered. We want to support the FREE music scene aswell as the commercial scene. They both have there merits. Remix64 is just weeks away from release. 21st of June to be precise. So whats been going on since i last wrote here. Well it's been pretty much of a waiting game really. But there are one or two things that has happened. The review by Andrew Fisher was very pleasing, though admitadly i found one or two things odd with the review. But thats always gonna happen isn't it? Music4games.net have shown interest in the CD, and looks likely they'll be reviewing it in the near future. This is ofcourse a very anxious time for us as this will be the first publically printed review (apart from Andrew's). Hopefully it'll go down well at music4games. The Glider Rider remix on the CD has also been given a special rework for BITLIVE and the BITLIVE CD. Ofcourse the remix on the remix64 CD will remain as it is. So for those who are attending Bitlive this will be the first exclusive play of the rework. It started off as the remix64 CD was gonna just be played over the air at Southpole Radio. Then suddenly it turned out to be a complete show. We'll be playing some of The remix64 tracks on the show, but not only that... Some tracks from bit 1,2,3, karma64, Nexus, Galway Remixed, and Instant Remedy. But also some of the better RKO tunes. All This kicks off on Sept. 1st 2002, so be there for the launch.  PC gameplay has added a cover CD to their magazine with some great c64 remixes. Oddly they've called the section... Remix64 - Audio music for the 8'bit generation. (mmm.. Where have i heard that before!?!?!.. Please note that it actually contains no music from our CD in any shape or form, which makes it even odder. I'm currently writing some information for the magazine sequencers , who wish to do an article on remix64 CD, the label and the musicians on the CD. Plus a review of the CD. Sounds like this could be quite a big article. We'll see! The CD is now being sold at Bjorn Lynne's shop, and synsoniq aswell as C64audio.com. So you can buy it from any of these three places. Though i would urge you to buy it directly from c64audio.com as then much more of the money goes to peeps like Rob Hubbard, Martin Galway etc.. A review is imminent at games4music.com of the remix64 CD (they've already previewed it). I know i said that it was imminent before, but thanx to Royal Mail it got lost in the post. Yeah Yeah i know my day job is a postman - LOL! It's been a long time since i wrote here. but here we go again, cos we have news a bundle so to speak. The is gonna be an article as mentioned previously in record collector regarding C64 music and specifically the Remix64 CD. David Hemmingway contacted me again just reciently stating he'd just got around to writing the article. He posted some questions to me which i also forwarded on to some of the arrangers. The article sounds quite big, and i'm pleased that one of the biggest music magazines in the world have taken note of the scene. Ok, remix64 volume 2 is on the way, and i've recruited some peeps already. Thomas Detert and Markus Holler returns from Volume 1. With O2 also joining the ranks. There will be more names to come, as i'm still pondering my options. The CD is gonna be called (provisionally titled) remix64 - Emotions and will feature some of the more melodic pieces of work from the C64 with a big time Emotional feel to them. I've been talking to O2 about the remix of Think Twice 3 and there are some great ideas coming out for the remix, which may include one of the biggest credits ever seen for a remix, we are hopeful that we can realise our ambition with this remix though as yet nothing is set in stone. I've recruited more musicians now, and the line-up is looking more and more impressive by the day. I'll not be announcing who will be on the CD untill i have a full line up of musicans. I've also now recruited the Artist for remix64 volume 2, his name should be familiar to many as he did many c64 game graphics for xample. His name... Thomas Heinrich . Shades, Think Twice 3, Commando High-score, Gianna Sisters track 2, Fist 2. More to be confirmed at a later date. Note: All Tracks are subject to change. I hadn't noticed i had not written in this section till Markus Schneider had point it out, Thanks Markus. So whats been happening since i last wrote here? Quite a lot really. It's been a fascinating couple of months working on the CD with musicians coming and going, tracks changing. and already 2 finished pieces of music. Markus Schneider, Thomas Detert, O2, Rafael Dyll, Markus Holler, Glyn R Brown, Jan Morgenstern, Carl Larsson (nightbeat), Gianluca Verrengia. Fist two is a beautiful vocal/piano/flute piece in a kinda oriental/celtic style. The track features Markus playing a REAL flute with some really nice vocals from his girlfriend. Markus Schneider has reworked Thanatos in an orchestral love theme style. The piece takes the strongest elements from the sid and builds around them using Markus's own ideas creating a sublime piece of music that changes direction and mood constantly. The CD in general isn't what you'd expect from c64 remixes, as it doesn't just take the sid and manipulate it in a one for one kinda way. I've asked the musicians to try and interperate the sid and build around the strongest elements. This means that the music found on remix64 v2 is a big progression in how remixing is done and brings a new direction to c64 music in general. The CD is aimed ofcourse at the c64 remixing scene, but also looks further afield by re-inventing it sonically. This in turn should (theory has it) bring a new audience as it's also aimed at a wider audience. it's not just sid remixing it's a real musical venture which will be appreciated (hopefully) by anyone who is interested in music and not just remixing. Yeah, it's a gamble alright and yes it could fall flat on it's face, but judging from the many betas and finished pieces i have worked with I'm more than satisfied with the results. Infact I'm over the moon. Thanatos, Butcher Hill, Spellbound, Fist2 & Shades. This remix is superbly orchestrated, there isn't a set emotion to this one really... it has a blend of moods and emotions that constantly change and gives the listener swings of sorrow to uplifting. Generally it has a kind of eve of the battle feel. we won, but we lost many men kind of thing! hence the subtitle to this tune is... Sorrow of Victory. Shades, is very much a love ballad, it's really beautiful, but we are still undicided wether it will appear on the CD or not. Well, just about all the music is completed. We are just putting in some final adjustments to some of the tracks we have. But by and large the musical side of the CD is ready. The front cover art now designed by Michael Satszer as Thomas Heinrich unfortunately had to withdraw. I've seen an early outline of the cover and i'm very impressed with not just the art but the ideas from Michael, who incidentally will be designing the booklet for the CD too. Thomas Boecker (merregnon 1&2) has been a constant support to the project and will be writing the foreword to the booklet. At this point i'd personally like to thank Thomas for help and time. Also regarding the thanks, i'd like to extend a warm thankyou to Larsec as he's gone well beyond the call of duty in helping me whenever he can. He's basically become my right hand man during the project and undoubtably the CD has become a far better entity with his suport and help and friendship. There's so many more people who will be duely credited in time, but these two guys i've mentioned have been invaluable. I'm currently designing the webpage for the CD, complete with screen shots, front covers, CD art, Downloads, samples, info's, interviews, and more. The page if all the info comes through as expected could be online within a couple of weeks. It could be seen as an extension to the booklet, all the stuff we'd love to put in the booklet but havn't got space for. The CD at the moment is actually ahead of schedule, which is rare, but very nice. But i'll not count my chickens before they htach as things can go the other way with a click of the fingers, so i'll need to keep diligent and not get cocky and slack off. Well, the CD had a brief play at Bitlive Germany with a premiere of shades. Also Fist2 had a play at Slay Radio some time ago and coments circulating back have been favourable. The music has been totally finished and has even been mastered at the Airbase Media Studio in germany by Thomas Detert. Tho the music has been finished and is actually ready for being shipped off to the Factory for Duplicating, we are still waiting for the booklet to be designed. Projects of this nature and size can be difficult to manage and not always does things run as smoothly as you'd like, thats been a problem especially with the booklet and design. I think we are still on schedule for a september release tho. As you may have noticed the original publishers of Remix64 vol.1 (c64 audio.com) will not be publishing volume 2, instead it will be published by ourselves via a seperate website. Thus in turn we have basically become our own record label. Kinda strange really, as i didn't set out originally to do this, it just happened i guess. Any further commercial products will also be released through this, tho the era of c64 remix CD's will come to an end after volume 2. So whats planned for this new record label exactly. Well already i have 2 projects ready to go that are in no way connected to the c64 scene. One of the projects is Huge and will take many years to complete. I've had the idea floating around since i started volume 1, but wished to wait for a while and gain further knowledge. Now after volume 2 is finished i think i have what i need to start looking further into the project i've always had on my mind. The website needs to be online tho, for the labels first release which is ofcourse r64 v2. Worringly this may also have an effect on the release date of the CD. Not to worry, i'll always be around the scene in some shape or form in the future, and will try to contribute to remix64 whenever possible. But i now look to go onto something a little more challenging. It is with regret that the release of Remix64 Volume 2 has had to be delayed by 1 month. This is due to many circumstances beyond my control. Planing something of the size of remix64 is extremely difficult (the team now reaches almost 30 people, which is over trebble the amount of volume 1). If a single delay in the production line of the project happens it has a massive knock on effect. Tho these delays have fortunately been kept to a minimum they have occurred and thus progress has been hindered. Remix64 v2 as you may already be aware is an independant product and thus in it's self creates a whole new workload and a lot of setting up. Delays have also been caused by other parties not associated with the CD such as MCPS, who twice agreed to send me the licensing forms and as yet none have arrived. I've spoken to them again yesterday and they have assured me they are on their way. Due to legal reasons i am prevented to print the CD's without first obtaining the license. This may take a while to gain, but really should have been sorted out by now. Also unfortunately due to increased underlying costs in setting up a shop and the increased price of CD printing i have been forced to set a r.r.p of £11.99. This price is £1 above the cost of volume 1. Even at this price i would need to sell most of the 1st run just to break even. However volume 2 of Remix64 is masively improved upon volume 1 in nearly all areas. The introduction of a variety of flutes, guitars, bass, drums, and violins, with several vocalists and almost deffinately the best orchestral sound libary currently available (The vienna sound libary). Remix64 volume 2 was also studio mastered at the Airbase media studio in germany. The booklet itself is also drastically improved. Volume 2 will be 12 pages long in full colour with a colour picture disk. With this in mind i feel the £1 price increase is justified. They say never work with animals. The same could be said for artists as today i reveal my 4th designer to the team for v2. Fabio from Italy has taken over the reigns as artist/booklet designer after the 3rd designer suggested that delays were going to continue on the project for the forseable future and through mutal agreement we decided to find a new designer. Unfortunately through discussion with Fabio it was decided that the Front cover currently displayed has been axed. It just wouldn't fit to our plans and that of fabio's. So we are basically starting afresh with the booklet right from scratch. Unfortunately, this means the project won't be on sale for sometime yet at a guess we could be looking for a christmas release. Oh, well it'll make a nice present at least. The MBDrecords website which is also the publishers website is still being worked on. There's much to consider here. Like which companies to use for selling the CD. One that seems certain is Paypal and others are being considered. Paypal seems pretty universal and user friendly aswell as being quite popular. During the time of delay its been possible to make some minor improvements on the mastering side of a few tracks, even now Rubicon was been remastered. One thing i have noticed during creating MBD is that the costs of starting up are staggering and the time spent on such things are quite often more time than whats in a day, and it's set to get even busier over the coming weeks leading up to volume 2's release. One thing that has really annoyed me over the last few months is people who have contacted me ofering help and assistance (which i am always forthcoming with) only to then not to bother. I mean i'd rather them not contact me in the first place if thats going to happen. Sometimes i have sort information or asked for assistance for people to say Sure yes i'll support you, then nothing... just say NO please from the start and i'm happy. Please always feel free to contact me with any assistance you feel, from website help to media help... BUT ONLY IF IT'S GENUINE! sorry for that whinge-fest, but when the number of let downs reaches double figures you do begin to loose faith in humanity. We are so so close now to being to ready to ship the product to the printers. Everything is complete and we are doing the final round of quality control. Basically just cleaning up the booklet and making final changes to any spelling errors, but by and large we have finished the work. Release date which is now official is: December with pre-orders being taken early November. Something that occured to me was that we have been working on this product now for well over a year. From initial design to where we are now it's been a total flog. The remixers i have worked with have all been absolutely brilliant with Thomas Detert being of exceptional help. I can't praise the guy enough he's been absolutely magnificent. I can say with all certainty that this CD surely wouldn't have been what it is now with out his help and ofcourse many other people. From Markus Holler who helped us with Glyns Times Of lore, Thomas Boecker for whom i have the so much respect for, Gianluca who's a terrific guy, Chris Abbott who's been very co-operative, Dan gilgrass who i consider now as a good mate and helping where others have failed, sumppi who's done those little things but essential things that needed doing, infact everyone who's worked on the project and some who havn't. A big hand has to be given to our booklet designer who has really worked his balls off and given a very nice design in such a small amount of time. Thankyou Fabio. I've worked with people who a few years ago i couldn't ever have imagined working with, and all of them are stars and all deserve to go onto bigger and better things. It's been an amazing year, the beta testers are buzzing about the product and i'm very satisfied by the product. it really is a massive step forward from volume 1 and i don't mean any disrespect to those who worked on v1, experience certainly does tell and thats more in my corner than anyone elses. I've been asked on many occaision wether there will be a v3. I've always said the answer to that is NO and at the moment it remains a NO. I'm now looking at doing an Atari ST remix CD and have already recruited many musicians for it (Some big suprises here). I'm also working with many musicians on what could turn out into effect some totally original music. That for me is something i want to investigate further, hence the MBD label. It's all early days yet though. Even i can't predict what will happen next. For now however i'm very very satisfied with what we have all achieved. please please don't get me wrong, i'm not boasting or anything, i'm just very proud of what we have achieved and i am very enthusiastic. At this point i want wish Jan Morgenstern the best of luck as he has just ventured in the big world of the music industry, quitting his job in the process. I hope it works out for him and i'm sure it will. We are using no less than four different systems for you to choose from. Two for UK customers and Two for international Customers. All are secure and safe. Internationally we have covered just about every country in the world (mostly). Here we will accept credit cards, International Cheques, and Cash in GBP's only. If your British then we'll accept ALL known methods of payment. Credit, Debit, Cheque, Cash, Postal Orders, and even Mobile phone sales. On the development side we are still ironing out a few errors within the booklet, but we will certainly be shipping the product to the printers sometime next week. This CD has been a massive challenge for everyone involved and though the journey has been long and hard fought i'm very proud of everyone who has been connected with the CD. All have gone beyond expectation. The last few months have been very frustrating, tho none as much as this last week. The meeting with the printers went well and we sat down to discuss exactly the layout. It was then we noticed a few formatting errors, so i returned back with the booklet designs so we would fix the problems.The booklet is currently back with the designer while we fix those problmes.. All should be well hopefully by early next week. I must say the printers have been wonderful and very helpful and infact gave me a guided tour of the establishment and speaking at length about the industry itself. I have to say i was very impressed how the company was ran and it felt very warm and friendly. Hopefully this time next week the product will finally be well on it's way to being manufactured. We've got the cart running nicely now after a few teething problems, and thanks to LMan for doing his jiggery pokery we managed to get around the problem. Thanks Markus. The website is roughly about half finished. It's actually viewable at the moment, but a little bit scrappy and uncompleted as yet. Thats been frustrating in itself really, so much so i started investigating the whole web design thing as a stand-by just in case things didn't go as planned. Well, most of it is ready, i hope soon the rest will be, because really we should be opening the site up now and ready to take orders. Overall we've come along way in the last month, but on a personal level i would have hoped we'd have progressed further by now. It's all very frustrating really. A company that best be described as about being as competent as a glass criket bat. I've had nothing but problems with them since day one. lets see.... Firstly it took about 4 contacts with them for them to send me the forms needed, then when the forms do come, they keep coming. Then i mailed them an enquiry, three months later they get back to me stating...Sorry for the delay but out we've had problems with our computer system. Three months to get something as important like that fixed?!?! i ask you!. Now they don't even seem to understand there own system, or at least don't bother to act on it. I was invoiced for the royalties and instantly noticed they'd only acted on behalf of half the musicians. The other half was the ones under chis's supervision. Those tracks chris gave me all the relevant information which normally i wouldn't known and only MCPS would have and there original publisher. So obviously i had to be as detailed as possible regarding the tracks which weren't under chris's control, only to find they igniored them. It seems because i didn't give them the information which they would only know themselves they thought bugger it. Hence now i have to go chasing things up and find out information from them to tell them what the information is! confused? you bet! What really annoys me no end. Is that i HAVE to deal with them. There's no other way about it. They have control of their own members but seem not really interested in acting on behalf of them. There's no other company i can deal with it's exclusive to them and in this day and age where competition is welcomed i find the options here are very limited... Well i say limited, there isn't another option at all. If i ran Music by Design in this manner i'd fully expect customers to leave in their droves. Fortunately for MCPS that won't happen, cos we as publishers are forced to deal with them or we break the law. Farcical at best. Don't get me wrong i think a governing body is a good thing and MBD will always be a responsable company and pay ALL royalties. I just think a company so lack-lustre as MCPS isn't the answer. MCPS... it's a good thing, so please make it work!!! On a brighter side Remix64 v2 is soon to land on our door mats we are taking pre-orders now. Why pre-order? Well with christmas coming up and the gease getting a little bit fatter, I'm sure many people interested in v2 would want their copy as a Christmas present. By pre-ordering it helps us get things ready so when the shipment of CD's come in, we can basically send them straight out to our valued customers. Ordering later in december means that we have to battle to try and get you the CD's before x-mas, and with Royal Mail often being upto a week behind during the christmas rush it's quite obvious that orders made when the CD is released may not land on your doorstep before christmas. If you want the best chance of delivery before x-mas i would highly recommend you pre-order now. You see what we are doing is dealing with all orders as if we was ready to ship, the correct invoicing labelling and database entries. Packets are made up and even stamped. So when the CD's arrive its a matter of just slipping a CD in the packet and shipping it off. Obviously these pre-orders take high priority first. want your CD before christmas? ORDER NOW! With the website now up and i may say just in time. I'd like to give Juha a big thanks for his help here. Another Star from within the remix64 team. The great thing is that everything is running so smoothly which is always a bit of a concern when a site is so young. Not one problem has arised, but then i hope it wouldn't as it was beta tested heavilly. Feel like supporting the CD, want to do your bit? well apart from purchasing the CD, you could if you feel like being a very nice and helpful fella display the banner on your website. Thanks to DHS for his support in this regard. It's taken slightly longer than anticipated to actually release the CD. The main reason for this was we had to re-format the page within the booklet as it seems the printing company use a non standard way of printing. Not that it'll make the slightest bit of difference to the final product, it just ment that we had to jiggle the format slightly. I'm confident that remix64 Into Eternity will be released this week and will go on general sale as soon as we get stock. You can still pre-order which will give you the best chance of receiving your CD's before X-mas. Tho, nothing is deffinate they will get there before then, but pre-ordering gives the best chance. In slightly other news, work has now started on an Atari ST remix CD. This CD will be the last remix type CD of it's kind which will be produced by MBD. Unless ofcourse sales of both v2 and the ST CD suprise me. I've been speaking with many artists about publishing CD's and i'm nicely suprised just how successful these negotiations have been. Year 2004 will see many new releases through MBD and these will not be remix CD's. Though i cannot yet give out any details of who will appear under the MBD name, rest assured there's some good stuff on it's way. I'd just like to give a great big thanks to Juha (sumpii) who's been magnificent. Thanks to him, he's given me some great ideas and a fantastic template to work on with designing the website. When you have a nice site it makes negotiating so much easier. Afterall part of negotating deals is giving the interested party something to prove MBD's worth. anyway... Remix64 Into Eternity should be released this week. Be quick and be good and you might just have it in time for chrimbo. The feedback has been very possitive so far (coments can be found at the bottom of the CD page)with one or two people a bit perplexed as they don't really understand the CD. One statement that keeps croping up and thats the statement of HIGH QUALITY, so i'm pleased with that as above and beyond all a lot of effort was put in to making it that way. There's some reviews on their way over the coming months which i have lined up, but i won't say who and where as i've fallen into the trap of naming things before only to find them non existant promises. I'm often trying many places to gain articles or reviews but i am often greeted with no response. Thats actually very frustrating, if these so called media types would just acknowledge an e-mail it'd be so much more cooperative. Often find myself wondering if my e-mail is going wrong when infact it's obviously not. Remix64 v2 can be purchased direct from http://www.mbdrecords.com but so far also at c64audio.com and Bjorn Lynne. It seems very unlikely that synsoniq will be stocking the CD as despite my many e-mails they too choose to ignore me. which sadens me somewhat. Well, so goes the Christmas frolicks. I dunno about you but i'm glad to see the back of it. I'm not an X-masy person really. (Whats that? Scrooge ?). So 2004 is here and whats happening? Well due to the festive period not a great deal really. There's a few articles/reviews on their way but i doubt if there will be much soon. Got myself a new pc a couple of days ago with all the trimings including a nice 6 speaker surround system. Boy does playing these C64 remix CD's make a world of difference on a proper set-up. I was listening to Karma64 just yesterday on the new set-up and sanxion still remains to this day one of my favourite remixes. So i probably know what your thinking? so did i produce this CD on a really poor speaker system? well yes i did actually. My theory behind it was that if it sounds good on a crappy system then on a good system it'd sound so much better, and infact so it does, but then so does everything ;) So at the end i haven't a clue if my theory worked or not. I'd like to thank everyone for buying the CD so far, your support means much to us, and it's been especially nice that with Volume 2 being released that volume 1 has had an uprise in sales. It'd be a shame to miss out on the collection if you only own Volume 2 and ofcourse the reverse could be said. I still don't own a copy of Sidologie, i went to order it sometime ago, but got called away from the PC and for some reason just havn't got around to buying it ever since. I don't really know why as i'm a big fan of both Marcel Donne and o2. Thats certainly a must buy and i'll just have to get my trusty credit card into use and get my backside into gear.